Newly-promoted Barkby United moved up to second place in the Premier as they inflicted a first defeat of the season on Leicester Ivanhoe on Saturday. Skipper Steve Flowers won the toss at Beeby Road and invited the visitors to bat first. New ball bowler Ryan Waplington started well, claiming a wicket in his second over, but wayward bowling and 15 wides later allowed the visitors a steady start without having to do a great deal. Ian Kirk’s introduction again turned the game as he struck first ball with the score on 70. Three overs later it was 80-3 when Lloyd Phillips, making his Premier League debut behind the stumps, snaffled a thin edge to give Kirk his second wicket. Eamonn Bourke provided great control from the pavilion to heap pressure on the batsmen and was rewarded with figures of 2 for 23 from his 10 overs. Ivanhoe dug in at 110-5, content to play out many overs with Jamie Drake bowling tightly and Tom Flowers also offering control. Tom grabbed two late wickets and Aiden Morris returned to pick up one as Ivanhoe finished on a respectable 204-8 from their 50 overs. Barkby’s reply began badly as the previous week’s centurion Ian Kirk (1) was struck in line in the second over. In-form Tom Flowers immediately went on the attack, but Matt Boyce struggled to find his usual fluency and was caught at mid-on from a leading edge (35-2). Captain Steve Flowers joined his brother and supported him initially as Tom continued to punish anything slightly short or full, racing to 50 from just 42 balls. He looked set to take the game away from the visitors until spin proved his downfall, going back to the wrong ball to be bowled for an excellent 61 (11 fours and one six). Steve then took over the reigns as the aggressor, targeting the short boundary and despite losing both Harby and Morris cheaply, he continued to look confident, reaching 50 from 46 balls. At 135-5, the game was in the balance with 70 runs still required. Bourke battled through a testing period in support, while Flowers continued to put the bad ball. Bourke and Waplington went in quick succession with 30 runs to win and three wickets in hand. 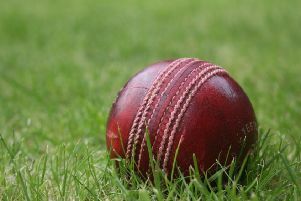 Jamie Drake looked solid and calm, hitting two fours in his first six balls, and when Steve pulled a six into the next field, the runs required were down to single figures. Steve was bowled for 80, having struck six fours and five sixes, with just eight to win. A Phillips edge past the slips gave Barkby a welcome boundary before Drake hit the winning runs with a glorious cover drive to set up a top-of-the-table clash at Lutterworth on Saturday (12.30pm).